Georgette Symonds was raised in an Irish Catholic family in Brooklyn, New York. She spent the first twelve years of her education in the parochial school system. After a career in nursing, Ms. Symonds volunteered in the criminal investigations unit for a local police department. She went on to utilize her knowledge of spiritual and emotional conflict to become a published author. She is a member of the ﻿﻿International Women’s Writing Guild﻿﻿ and Sisters in Crime. Ms. Symonds has been featured on the TV show For the Record. She has also been a guest on the radio shows, Tony Jackson’s Irish Country and New York’s Jim& Kim’s Morning Show KJOY 98.3 FM. Her books have sold internationally. As Father O’Reilly struggles not to break the Sacramental Seal of Confession, Detectives Jamie Lawson and Fred Washington race the clock to find Kevin Burns. 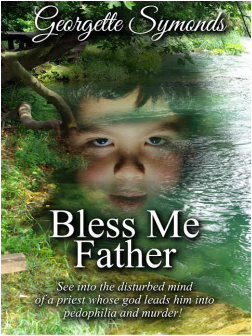 In the fast paced suspense novel, BLESS ME FATHER, Father O’Reilly fights an inner battle as he tries to rid the Catholic Church of the evil thread running through it.